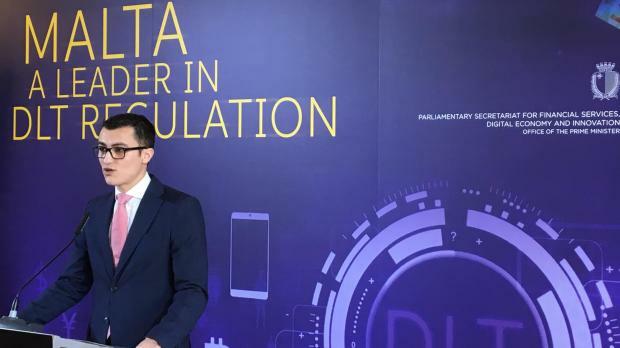 Malta Digital Innovation Authority along with accompanying legislation on its operation and the use of virtual currencies were unveiled by Digital Economy Parliamentary Secretary Silvio Schembri on Friday. Addressing a press conference, Mr Schembri said the new authority would not only act as a regulator and watchdog for the sector, but also as a consultative body tasked with promoting government policy and protecting the jurisdiction's reputation. "We want an eco-system that encourages operators to move here. It's not going to be about sun and favourable tax rates - we want it to pay to operate in Malta," he said. The new regulatory body will be formally set up once the proposed laws governing it and the avant-garde sector are passed through Parliament. "Why are we doing all of this? To provide the necessary legal certainty to allow this industry to flourish," he said. The government is also proposing a framework for certification of what is known as Distributed Ledger Technology - the umbrella term for Blockchainesque systems. In lay terms a DLT is a sort of decentralised digital database which can have a number of different applications from currency transactions (what virtual currency Bitcoin and the platform Blockchain are most famous for) to supply chain management, or even certification - something the government already launched a pilot project on last year. Government sources have estimated that the sector could rival Malta's golden egg laying goose - online gaming, within the next five to 10 years. "The government is pushing forward on this after it was approached by a number of major investors interested in operating in a country that is the first to hit the ground running," the sources said. Meanwhile, Dr Schembri said the government had already identified a number of niches that it wanted to explore. "We will be developing a framework for instance, for what are know as system auditors (a sort of technology surveyor) who will operate in Malta once the industry is on the ground," he said. Sources said the government was also working on a green paper on Artificial Intelligence and the Internet Of Things - the connection via the Internet of computing devices embedded in everyday objects, like household appliances, enabling them to send and receive data from one another. Dr Schembri said that the legislation on the proposed authority, along with other legislation on the industry framework, and a draft Virtual Currency Bill, had all been based on months of consultation with national entities like the Malta Financial Services Authority and the Central Bank. The police and the Financial Intelligence Analysis Unit had also been roped in to help draft the legislation and Dr Schembri said unofficial meetings had been held with EU-level entities as the technology had a bearing on the whole union. Blockchain technology is not without its controversy and many countries have so far been cautious about implementing a technology that is viewed as a potential money laundering risk by some international authorities. Asked about this, Dr Schembri said this was why the government had put a strong focus on regulation - looking to have a competent authority focused specifically on this. The proposed legislation will now undergo a brief three-week consultation, before hitting Parliament.